This article was originally published in the December issue of the Shout NZ. For the majority of the world, Christmas is spent gathered around the fireplace surrounded by loved ones. The cold, wintery weather common in the northern hemisphere draws people together as they seek out warmth, indulge in rich foods, and reflect on years past, present, and future. However, a Kiwi Christmas is an altogether different experience. While the holiday is still a time for togetherness, the warm weather casts us out into the world and inspires us to hit the beaches and the backyard barbecues that abound during this time of year. Much in the same way, Christmas tends to be the time of year when many British and U.S. breweries roll out their Barleywines, spiced beers, and other seasonal brews. Traditional Christmas beer is much like Christmas food in those parts of the world. It tends to be big, bold, intense, and highly alcoholic. 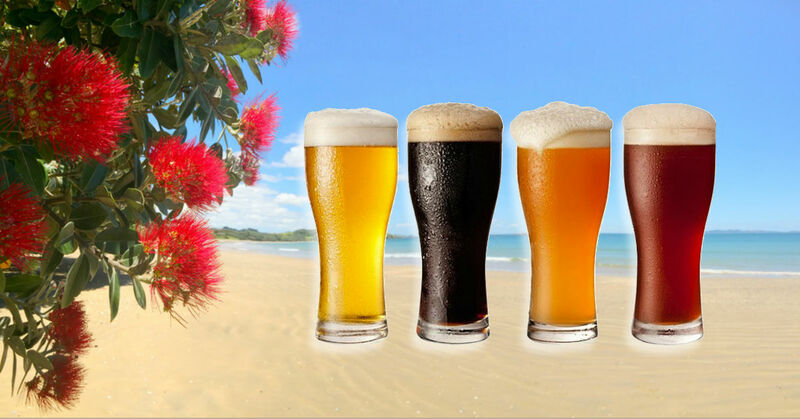 While these beers may be the perfect winter warmers, they rarely hit the spot during the peak of summer, which of course is when we in New Zealand experience the Christmas holiday. There is probably no other image more synonymous with Christmas in New Zealand than the iconic pōhutukawa flower. As such Kereru’s Pōhutukawa Golden Ale seems like the perfect way to kick off our Kiwi Christmas beer list. This mildly hopped golden ale is brewed with pōhutukawa honey and gently toasted New Zealand malt. The pōhutukawa honey gives the beer a hint of salted caramel, which contrasts nicely against floral New Zealand hops. It’s an easy drinking summer ale that will go well with BBQ, seafood, pizza, or any other summery meal. In many ways Saison is the perfect style of beer for a Kiwi Christmas. It’s dry finish makes it a beer that goes down well on a warm day, and it’s spicy and complex flavours give it that “something special”, which really suits the season. Craftwork’s “Saison Anise” is a full-flavoured Saison brewed with Canterbury pilsner and crystal malts, candi sugar, and – as its name would suggest – anise. If you haven’t had the pleasure of trying a beer from Craftwork then you are missing out on one of New Zealand’s most special and unique breweries. Despite their popularity, they continue to brew on a tiny 50-liter brewing kit and each beer seems to be an homage to some traditional Belgian style of beer or process. The spicy contribution from the anise, and the relative rarity of Craftwork’s beer, (not to mention the fact that this easy-drinking beer clocks in at 7% ABV) makes “Saison Anise” a beer that is sure to enhance your Christmas spirit. With so much flavourful food (and drink) to be enjoyed over the holidays, we sometimes need a bit of a palate refresher to get us through the occasion. A Berliner Weisse can be just the beer to do the trick. A Berliner Weisse is a pale, refreshing, low-alcohol, traditional sour wheat beer from Germany. Tiamana’s “Meister” is a 2.4% traditional Berliner Weisse that is brewed using “Waldmeister” (a Sweet Woodruff infused syrup) to balance the beer’s lacto-brett acidity and sourness. Traditionally the Waldmeister is served on the side. In the case of Meister, it is already added to the beer giving the beer a serendipitously Christmas-like green hue. A Wunderkammer is a special cabinet that holds your most treasured belongings. The belongings usually have nothing to do with gold, silver or precious gems. Rather, it is filled with objects that remind us of how valuable our time on earth is. It is an embodiment of the Christmas spirit, if ever there was one. The concept behind this beer definitely earns it a place on our list. This “Imperial Cream Ale” pours amber with golden highlights and features hints of toasted almonds, vanilla, biscuity caramel, and – what Outlier Cartel calls – “an almost croissant-like base from the malts used”. At 9% ABV this beer may be a bit too strong for a Christmas barbecue at the beach, but it might just make for the perfect holiday nightcap out on the veranda. Boneface’s Gose is the perfect beer for the discerning craft beer drinker who wants something light and refreshing (but still full-flavoured) for that sunny holiday afternoon by the barbecue. Gose (pronounced Goes-uh) is a tart, slightly salty, wheat beer, traditionally brewed with the addition of Coriander. In the case of “The Juice”, Boneface has traded out the coriander for a generous dry-hop addition, making for a more modern interpretation of the style that is both quaffable and unique. Taieri George is named after Richard Emerson’s father, a founding member of the Taieri George Railway. This beer (one of his favourites) is brewed each year in his memory. The beer is a spiced ale, brewed with cinnamon, nutmeg and Otago clover honey, evoking flavours reminiscent of hot-cross buns. While not a beer that you will likely drink by the six pack, it’s use of holiday spices make it one of the few classic “Christmas beers” on our list (unintentional as that may be). While you may be dreaming of a white Christmas, the closest you’re going to get in New Zealand is a White IPA. A White IPA is a fruity, spicy, refreshing version of an American IPA, which is lighter in colour (in part due to the inclusion of wheat in the grist). It features either the distinctive yeast and/or spice additions typical of a Belgian Witbier. To make “Snow White IPA”, Epic actually headed into the mountains and collected some snow to brew with. The result was a hazy white IPA with an orangey citrus character that comes from a marriage of crushed coriander seeds, Cascade and Centennial hops. It’s said that in England’s Deep South,“pig squeal”, is slang for a sour tannic cider. However, the “pig Squeal” offered by Wellington’s Garage Project is a unique blend of sour wort and apple juice (the juice supplied by Peckham’s Cider). The mixture is then co-fermented and lightly dry hopped. The result is a juicy, aromatic cross-bred beer with a refreshingly sour apple twist. With apples playing a starring role in so many traditional Christmas desserts, this unique brew is sure to add a dash of sentimental holiday flare to your summertime Christmas. It doesn’t have to be a Christmassy beer in order to be the right beer for Christmas. Sometimes you just want a beer that tastes like, well… beer. While not easy to get outside of Northland, Kainui Brew Co’s Postman Pilsner will make the perfect addition to your chilly bin this holiday season, especially if you’re heading up north to escape the “Big Smoke” as many Aucklanders are known to do. Kainui’s newest addition to their lineup is a golden lager with notes of citrus and melon balanced nicely against a soft, crackery malt profile. Holiday season or not, “the Postman always delivers”. With Christmas falling right in the middle of the peak of New Zealand’s cherry harvest, and with cherries being such a central ingredient in so many traditional holiday treats, this beer list just wouldn’t be complete without at least one deliciously cherry-centric beer to get us in the yuletide spirit. There is no need to look any further than the 2015 vintage of Moa’s Cherry Sour (still available at various retailers throughout the country). “Moa Cherry Sour” is a barrel fermented and aged cherry sour beer. Brewed with a wheat beer base and whole Marlborough cherries, this beer spends 12 months aging on both the skins and stones of the fruit. The result is a funky sour beer that is loaded with cherry flavour. No Christmas is complete without a stocking full of chocolate treats. Make sure one of those treats is Behemoth’s “Triple Chocolate Milk Stout”. This beer starts off as a traditional Milk Stout, but is then infused with Dutch Cocoa powder, cocoa nibs, and a bit of vanilla for good measure. It’s the perfect dessert beer to pair with your Christmas pudding. For a special treat try blending the beer with Moa’s Cheery Sour for Christmassy Cherry Cordial in a glass. Ok, ok, I know I said that there was little place for these giant, highly alcoholic, traditional winter warmers in New Zealand given the fact that Christmas falls in the middle of summer down here in the Southern Hemisphere. But there is something to be said for tradition, and there are few beer styles more quintessentially Christmas than the Barleywine. 8 Wired’s “Lord of the Atlas” is a 12% ABV monster that incorporates elements from across the globe. This malty, winter warmer is an American style Barleywine, brewed with New Zealand malt, Australian hops, English yeast, and which is then aged on French oak. Make no mistake, this is NOT a beer to throw back while lounging by the sea on a hot summer afternoon. But once the children are all tucked in their beds and the presents are all laid out under the tree, a snifter of “Lord of the Atlas” might just be the perfect way to spend your Kiwi Christmas eve.